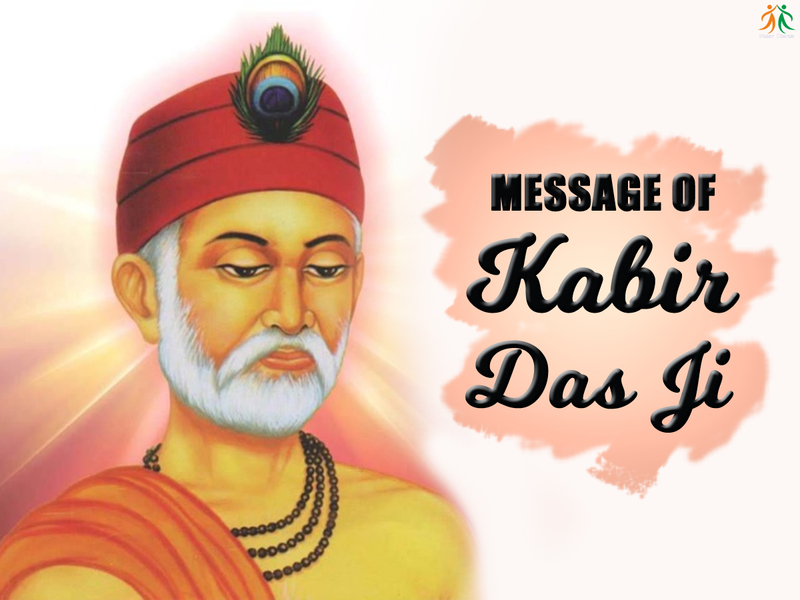 A shining star in the galaxy of great Indian saints, Kabir was one of the chief exponents of the spirituality which has always been the inner experiential core of religions and the connecting thread of humanity. He was born at a time when the Bhakti Movement was in full swing in medieval 15th century India. A mystic, a sworn enemy of ritualism, who tore to shreds rituals and ceremonies by showing the hypocrisy involved, a bridge between Hindus and Muslims, he was amongst the most renowned saints of that revolutionary age. His thoughts and sayings penetrated practically everywhere in the country and helped further the cause of religious reformation. According to a prevailing legend, a brahmin took his widowed daughter to have darshan of the great ascetic teacher Ramananda who, not knowing her situation, wished on her the blessing of a son. His words couldn’t be retracted and when the child was born, his mother placed him on a lotus in Laharata Lake on the outskirts of Varanasi to conceal her shame. A Muslim weaver, Niru and his wife Nima, who were childless, noticed the beautiful newborn afloat on a giant lotus leaf. They considered the playful child to be a gift from God and adopted him. This supposedly happened around 1398 AD in the month of Jyeshth (May/June). A Qazi (Muslim scholar) was invited to name the baby. He opened the holy Quran and found the name ‘Kabir’, which means ‘the great one’. The Qazi, being reluctant to give this name to a poor weaver’s son, opened the Quran a number of times but the same name, which is one of the 99 names of God given in that scripture, appeared, so he was named ‘Kabir’. As he grew up and the subject of his formal education arose, he was convinced that all that one needed to learn were the letters comprising ‘Rama’, the name of the Lord he adored and worshipped. There was no need to learn the alphabet, as it emanated from the omnipresent Word of God. So he declared that he wouldn’t touch paper or ink, as the human body is itself a sacred book composed by the Almighty, to read which we have to turn within and realise the universal essence of life, so minutely and magnificently woven by our Creator. Kabir remained illiterate, but he acquired the real education of inner wisdom and spiritual insight from the divine Book of Life and extensive contact with saints and seers of different faiths over a number of years. His quest for spiritual insight took him to Varanasi, the prominent seat of religious practices that attracted leaders of various faiths. Hindu sadhus flocked there in great numbers as well as Sufis, Buddhists, Jains and other faiths too, some of whom made the city their centre and set up their mosques, monasteries and temples to worship their own Masters. Kabir enriched his spiritual motivation by long association and communion with them. Later he was attracted by the liberal outlook of the renowned saint Swami Ramananda. Many aspirants from various faiths used to come to this great teacher’s monastery on the bank of the Ganges for spiritual satisfaction. Kabir decided to follow him as his Guru, but how would the Swami accept a Muslim as his disciple? This was a barrier in his mind. He knew that Swamiji used to go to bathe in the Ganges around four o’clock in the morning, so one morning Kabir went and lay down in his path. When Ramanandaji passed by, his foot struck Kabir’s chest. He placed his hand on Kabir’s head and asked,”Are you hurt, my child?” Kabir replied, “Master, you called me your child and a child is entitled to his father’s assets, so please let me have your treasure of Knowledge.” Swami Ramanand initiated him into the Spiritual Knowledge and Kabir was reborn in the inner world of spirituality which is the essence of religions, access to which is granted by the grace of the Master. Kabir’s devotion to God manifested by pure love. This is in accordance with the belief of both the Hindu Vaishnava cult and the Islamic Sufi cult, who support devotion to the Lord with a guileless heart filled with pure love. In a period of Hindu-Muslim clashes over petty quarrels due to religious differences and orthodox views, it was Kabir’s special spiritual talent that managed to synthesize both the great faiths on the basis of their spiritual oneness, realizing which, mutual understanding and tolerance can be restored and the trivial matters of caste, creed, sect or community are discarded as irrelevant. This is why Kabir,when he served Swami Ramananda as his disciple,was respected as foremost by the other disciples. These sadhu visits have exhausted my patience. He never speaks of his beam and shuttle. His mind is imbued with the Name of God. Our daughter and sons have nothing to eat. But the sadhus are fed every day to their satisfaction. They get beds while we sleep on straw. We get parched chickpeas, they get bread. These sadhus and my husband have become one. Kabir sang his compositions to the masses, who assembled in large numbers to hear him. There is no authoritative text of his works. He did not commit his hymns and compositions to writing. All admit that he never touched pen and ink; all his teachings were oral. His disciples must have written them down. Research so far has unearthed some six dozen books bearing the name of Kabir. The ‘Bijak’ is the oldest and the most authoritative book of his teachings. I know the one God who is from the beginning. I do not believe in those whom He created and destroyed. If one knows God, that knowledge will make him immortal. and by Guru’s grace (the Knowledge) has explained everything to me. Most of his biographers accept 1398 A.D. as the date of his birth, but their accounts of his death vary. According to various records and surveys, Kabir is likely to have died in 1505 at Maghar. When he died, his Hindu and Muslim disciples began to quarrel over the disposal of his body. The Hindus wanted to burn it, whereas the Muslims wanted to bury it. The next morning, however, when they removed the sheet, they found only some flowers which they divided into two portions. The Muslims buried their share and the Hindus consigned theirs to the flames. There are two main ‘Kabir Panthi’ groups nowadays. The Panthis of Northern and Central India recognise two main divisions of their sect, one with its headquarters at the Kabir Chaura in Varanasi with a branch in Maghar, and the second, founded by Dharam Dass, with its headquarters in the Chattisgarh district. Kabir was a mystic par excellence and one who realizes his mystic teachings in totality (and not just his words) becomes enlightened .